Malika Pukhraj's iconic rendition of Hafeez Jalandhari's urdu nazm ‘Abhi Toh Main Jawaan Hun’ made them both legends in Indian sub-continent. "Turn the TV on for me," Dev said, "and sit with me for half an hour, so it doesn't play up while I'm watching." "But I'm going to play with my friends," Rosh complained. "It's my play time." "I know," Dev said. "I wouldn't have asked you if your father was home. And I don't know how to use this new-fangled technology." Qosh had just bought a Black and White TV. Theirs was the only house around with a TV in the neighborhood. Other than Qosh, only Rosh knew how to operate it. "But my friends are waiting, Grandpa," Rosh pleaded. "I'll be back later." "No!" said Dev. "By then, it would be too late." "But you never watch TV anyway," Rosh pouted. "What's so special today?" "Malika Pukhraj is visiting India," answered Dev. "Doordarshan is telecasting her live performance today. She is an extremely popular Pakistani singer and her singing is enjoyed by millions. Not only in Pakistan, but also in India. I haven't seen her since I left Pakistan decades ago." "Doesn't Malika mean a Queen?" asked Rosh, suddenly interested. "Is she a real Queen?" "She is a Queen," affirmed Dev. "Not of nations, but of hearts. And she's going to sing Abu-Al-Asar Hafeez Jalandhari's poem. He is a Pakistani Urdu poet." "Was he born in Jalandhar?" asked Rosh. "In the Indian Punjab?" "Yeah, in 1900," answered Dev, "four years before I was. It was part of British India then. When Pakistan became a separate nation in 1947, he moved to Lahore, and came to be known as Jullundhri because he hailed from Jullundhr. Another of his kalaam "Pak Sarzameen Shad Baad" is now the National Anthem of Pakistan." "But I don't understand Urdu," Rosh argued. "I'll be bored." "No, you won't," Dev promised. "You don't realize how much Urdu you know already. There are many Urdu words used in Hindi. Tell me what you don't get and I'll translate." Rosh had never seen a Queen before. So he stayed back with his grandfather and turned on the TV for him. "She's wearing no tiara," Rosh accused, when the camera focused on Malika. "Great people don't show off," Dev explained. "They are humble and grounded. They are bowed low, like the branches of a fruit-laden tree. Now be quiet, and let me enjoy." Rosh watched her and listened carefully, but he did not understand. Watching his grandfather though, who sat enthralled, he knew not to disturb. When the program ended, Rosh turned off the TV, and came and sat beside the old man he dearly loved. "Many people think this nazm (Urdu: नज़्म - melody) is about vices," Dev started speaking. "About alcohol drinking and uncontrolled passion. The world can appear rosy, when you are wearing rose-tinted goggles. Beauty after all, is in the eye of the beholder." "It can be perceived as a hedonist crying out for more sensual pleasures. Or as a Sufiana Kalaam (Urdu word, meaning mystical poetry), where a soul is yearning to be united with God. To each their own poison. But both relish what they want so much, they are never ready to leave." "My glasses are different. To me, this poem is a celebration of life. Of youth. Of living in the moment. You may be too young to judge yet, but are probably old enough to begin to understand." "Let me introduce you to its lyrics, then transliterate. Your understanding today will depend on your imagination and experience. But given time, perhaps you may get from it the same enjoyment it has given me today." "Abhi toh Main Jawaan Hun. Meaning, I am still youthful." Khayaal-e-zohd, abhi kahaan? Abhi to main javaan hun! Thoughts of abstinence, why so soon? I am still young!" "How can this be mystical poetry?" asked Rosh. "Seems like lustful poetry to me." "It is what you think it is," answered Dev. "Either perception is relevant to life. But don't you think it is brilliant advice to all of us who are caught up in life's push and pull to pause a moment and witness the wonder enfolding around us. Chaman ki simt kar nazar, samaan to dekh bekhabar." Bhalaa shabaab-o-aashiqi, alag huay bhi hain kabhi? Havaayen itr bez hon, toh shauq kyon na tez hon? Ubhaaratey ho aish per, toh kya karey koi bashar? Durust hai! To ho - magar, abhi to main javaan hoon! Have Passion and Youth ever been separated? And winds are fragrant, wouldn't desires be inflamed? When they arouse sensuously, what power can a preacher have? is right. Nevertheless, I'm as yet rather young!" "Gosh, it is beautiful!" sighed Dev. "Pregnant lyrics, powerful logic, poignant mausiqi (music). The singular most iconic rendition that got me interested in Urdu poetry and ghazals." Pour more, Pour more, Pour more, Pour more." No no, not yet, no no, not yet)." "She keeps repeating that she's still young," Rosh couldn't contain himself any longer, "but she's not javaan anymore." "She knows she's in a race against time," said Dev, "but her spirit is not beaten yet. That's why such emphasis on 'Abhi', which literally means 'right now'. In the end, she concedes that youth is temporary. But for her it becomes everlasting, as she never accepts that she's lost it yet - not even at her last breath." "She's in denial," Rosh blurted, then apologized quickly, "Allah maaf karey (begging God's forgiveness)!" "She's young at heart," Dev smiled, "which any person can be, regardless of their age. She is allowed to be that, even in the evening of her life. Bodies have limitations, but mind obeys no boundaries. That's why it repeats - Abhi toh Main Jawaan Hun. I'm still young. So let me be." "Magar kab tak (for how much longer)?" Rosh was baffled. "Hope that mind can say it till the last breath," Dev said and got up to finish his evening chores. Author note: Interestingly, Hafeez Jalandhari, the lyricist, died in 1982 at the age of 82. Dev, the fan, died in 1990, at the age of 86. 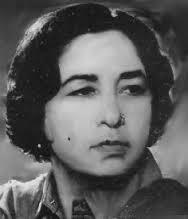 Malika - the singer (born near Jammu, British India in 1912), outlived them both. She died in 2004 at the age of 93. Her various live renditions of this song are on YouTube. Notable amongst these include the one embedded in this story, which was a recording done by Doordarshan when Malika revisited India in mid 1980s. Doordarshan had also done an earlier recording with her in late 1970s. This is the one talked about in this story. What Kinship With The World? Is A Goat A Goat? What Do We Work For?